Well, you know we all want to change the world. This is the hope of Jamie Oliver, his food “champions” and all of us who want to see a change to healthy, affordable, accessible, enjoyable and yes, easy to make meals. Now, you all know I love Jamie, but after last week I definitely have a deeper appreciation of how much he and his team are striving to bring healthy food awareness to the world. 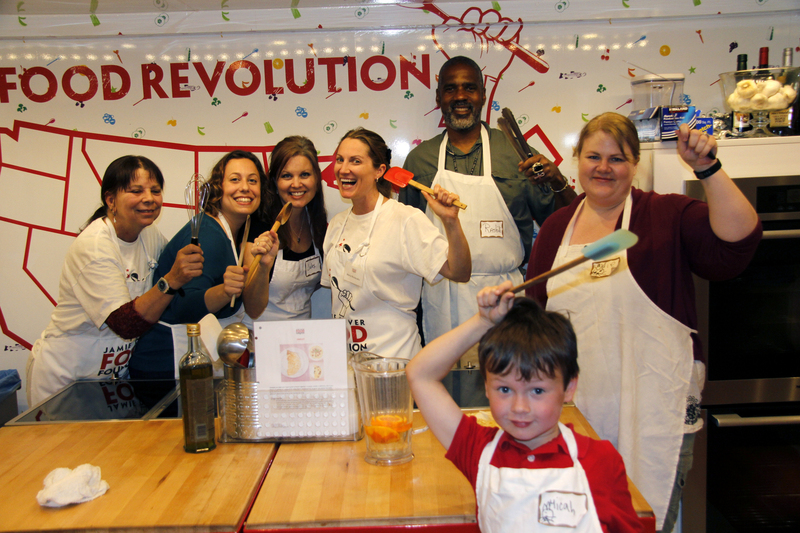 My friend Jenny and I had a chance to take a cooking lesson during Jamie Oliver’s Big Rig tour in Los Angeles. While I knew that “the man” would not be there showing us proper knife skills, I was very excited to finally attend one of his Food Revolution events. On a Friday afternoon, we headed down the 110 to the 105 to an area we don’t tend to frequent – Compton. Pulling into the parking lot of the King-Drew Medical Center, the Big Rig was hard to miss. It is a huge trailer that is kitted out inside with four cooking stations, two wash stations and a large demo station. The instructors, or Champions as they are called, were all so friendly and enthusiastic that you couldn’t help getting caught up in the excitement. Our meal was a basic risotto and a side of multi-colored cauliflower with a homemade vinaigrette. After a brief demonstration, we divided up in to small groups to get some hands-on cooking experience. My group consisted of Jenny, a mother, her seven year old son and an elderly gentleman. It seemed that almost everyone there, except Jenny and me, had attended several classes already and were signed up for the next week’s classes as well. It was really inspiring to talk to the mother who was taking these lessons because she and her husband had made a commitment to eat healthier for the sake of their son. We all got a chance to chop, stir, pour the broth and of course, clean up. The lesson was fairly basic but having had a few risotto disasters in the past (mainly stodgy ones), I was happy to have a good refresher on just how simple and easy it can be. As well, someone in our group couldn’t have dairy so it was easy to pull a bit aside for him before the knob of butter and the generous helping of parmesan was added at the end. So there you go, vegan for Clive and cheese-filled for me! A big thanks to all those who are volunteering their time to reach out to the community and help educate and improve health. Get involved in Jamie’s Food Revolution Day!